Vinehealth Australia is pleased to announce awards it has achieved. 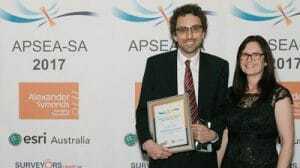 In 2017, Vinehealth Australia was announced winners of the inaugural Small Project Award at the South Australian Spatial Excellence Awards, for its Boundary Rider geofencing pilot project. These awards celebrate the latest applications, theories and techniques being applied in surveying, remote sensing and geographic information. Brendan Tully (GIS Specialist of Vinehealth Australia) and Deanna Hutchison (CEO of Spatial Industry Business Association (SIBA)). Photo – David Tran Photography 2017. 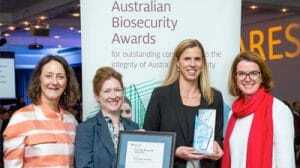 In 2017, South Australian vineyard owners have been recognised on a national stage for their commitment to biosecurity, through Vinehealth Australia receiving an Australian Biosecurity Industry Award, presented by the Department of Agriculture and Water Resources.The award recognises the group’s significant contribution to maintaining Australia’s wine industry biosecurity integrity. For Vinehealth’s media release on the award, click here. The details of this year’s award recipients are outlined here. 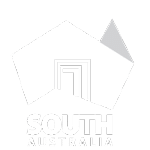 In 2014, Vinehealth Australia was announced winner of the South Australian Spatial Excellence Awards in the ‘Environment and Sustainability’ category for our online interactive web maps. These web maps allow users to run reports by query on grape variety and rootstock by geographic indicator region across South Australia. To use these interactive maps click here. We offer a range of communications channels to allow you to keep up to date with all things vine health and biosecurity. We publish News articles regularly. You can sign up to our e-news for monthly biosecurity bursts. Our Biosecurity Alerts are distributed to our e-news database when significant biosecurity events take place. We also share Featured Articles that mention Vinehealth Australia, case studies that celebrate best practice biosecurity and much more. Enjoy exploring our NEWS section. P.S. Don’t forget to follow us on social media for biosecurity tips and news.